November 25, 2009  President Obama will commit the U.S. to a goal of cuts in greenhouse gas emissions over the next decade at a climate conference in Copenhagen next month. His goal is to cut carbon dioxide emissions by about 17 percent from 2005 levels by 2020. November 25, 2009  President Obama will attend the climate change summit in Copenhagen next month and will commit the United States to reducing its production of greenhouse gases, the White House said Wednesday. November 19, 2009  President Obama wraps up his trip to Asia with a stop in South Korea, where leader Lee Myung-bak joked that Obama had saved the best for last. The two men discussed a range of issues, including free trade and the ever-present nuclear threat from North Korea. November 17, 2009  President Obama met with his Chinese counterpart, Hu Jintao, for wide-ranging talks on the challenges facing their two countries. The two discussed how they can pursue a more balanced economic strategy, cooperate on curbing greenhouse gas emissions and the spread of nuclear weapons. November 17, 2009  President Obama and his Chinese counterpart Hu Jintao agreed to cooperate in a number of issues ranging from climate change to nuclear weapons. During more than two hours of closed-door talks, Obama is said to have described human rights as a core bedrock principle for the U.S. He also urged Hu to restart talks with representatives of the Dalai Lama, Tibet's exiled spiritual leader. November 16, 2009  President Obama sat down for an informal dinner Monday with his Chinese counterpart, Hu Jintao. Serious discussions were put off until Tuesday when the two leaders will hold a more formal meeting in China's Great Hall of the People. Earlier, Obama told a group of college students in Shanghai that the U.S. welcomes China's growing influence in the world. November 16, 2009  President Obama is in Beijing, where he meets his Chinese counterpart Hu Jintao. Earlier Monday, Obama met with what the White House calls "future" Chinese leaders. He held a town hall-style meeting with college students in China's biggest city of Shanghai. Obama said he's a big believer in uncensored information, even if it is sometimes politically inconvenient. November 14, 2009  President Obama is vowing to strengthen U.S. ties to Asia in an effort to address global challenges such as climate change and the spread of nuclear weapons. Speaking in Tokyo Saturday, Obama also tried to sell renewed relations with Asia as a key to U.S. job growth. November 13, 2009  President Obama is just getting to know the Japanese premier, who took office less than three months ago. It is a period of adjustment for U.S.-Japanese relations. Obama pledges, "We will be deepening our engagement in this part of the world." His Asian trip also takes him to Singapore, China and South Korea. November 13, 2009  President Obama arrived in Tokyo on Friday, hoping to shore up relations with a new Japanese government, which is seeking to be more assertive with Washington. The trip is the start of a weeklong tour that will include stops in Singapore, China and South Korea. November 5, 2009  The Obama administration soon will be awarding billions of dollars in education grants to help local school districts raise the bar on student achievement. In order to qualify for the money, schools may have to grade not only students, but also teachers. November 3, 2009  The economy looms large Tuesday as an issue in New Jersey Gov. Jon Corzine's re-election bid and the other elections around the country. But President Obama's record on job creation will be front and center once again a year from now, when many more races will be on the ballot. October 30, 2009  The federal government releases its report on the how the economic stimulus has affected employment. The White House says jobs 650,000 have been saved or created under its plan. October 29, 2009  President Obama traveled to Dover Air Force Base after midnights to honor the Americans killed in Afghanistan earlier this week. 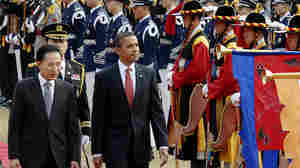 Obama joined the soldiers' families for the repatriation ceremony. October 29, 2009  President Obama made a midnight trip to Dover Air Force Base in Delaware to honor the return of fallen soldiers in Afghanistan. He was taking part in a solemn process to transfer the remains of 15 soldiers and three Drug Enforcement Agency agents from the C-17 cargo plane to a base mortuary.